Today I traveled 45 minutes to Camden County Community College to testify before the State Commission on the Use of Assessments in NJ headed by the State Commissioner of Education David Hespe. I left my house at 8:15 am and just walked in the door at 2:15 pm to one casualty of this war I have been fighting against the implementation of the PARCC test. I took this picture when I walked in the door at 2:15 pm from Camden. I have until the bus comes at 3:40 to write. 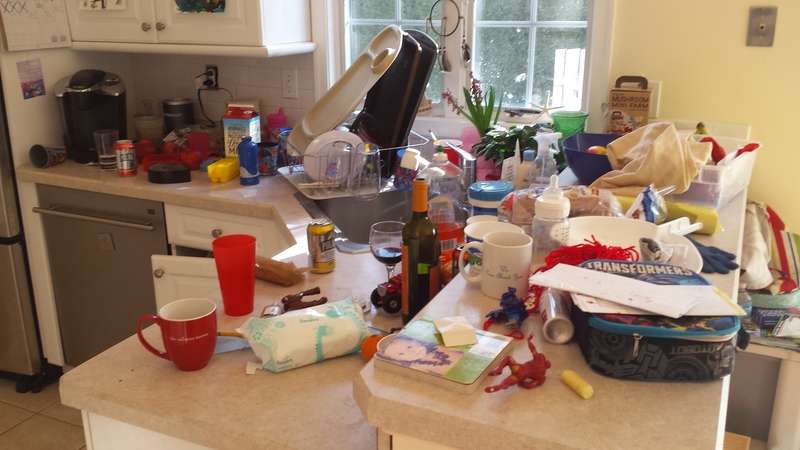 This picture of just one area of my kitchen, is a microcosm of my struggle to continue to be the best mom to my children that I can be, while I advocate for change in education. The wine I drowned my nerves in last night, the last board book I read to my daughter, a full yet abandoned lunchbox from my son who stayed home sick today, a baby bottle empty except some curdled drops, multiple coffee cups, saline nasal spray, washed dishes, unwashed dishes, a glove without a match, and even an unopened mushroom growing kit. So many people have remarked, “I don’t know how you do it!” They mean raise 4 kids and have time for anything else. Well the path that I have chosen may be noble, but it sure ain’t pretty (see Exhibit A). I started working on writing my testimony only a couple of days ago, after much procrastination and deliberation. Finding time was nearly impossible. Our two big kids had a 4 day weekend that became 5 days with a snow day. Then a pipe burst yesterday in our old house that we were in negotiations to sell to a very interested buyer (who knows how they feel about our house now that the whole kitchen is in pieces). Our kindergartner woke up with croup this morning, and it didn’t look likely that I would make it to Camden, but my gut insisted that I find a way. So my darling husband, against his better judgment packed up my (sick) 5-year-old, 4-year-old, and 16-month old and drove the whole crew an hour and 15 minutes to survey the damage in the old house and talk to a contractor. After dropping off my oldest at school at 8:15 am, I was feeling guilty and almost drove straight home, but instead I kept going to Camden. My point is that people like me make it look easy. It looks like I have it all together. Many of my friends jokingly call me supermom, but really I have no magical powers. My kitchen surely attests to that. The truth is that being involved, reading, writing, and advocating for change looks romantic, but it is hard. I hardly ever get to read books (my most favorite thing to do in the world) or watch television. Keeping up with the laundry for this family of 6 is impossible. The dishes to wash are endless. Groceries vanish faster than I can buy them. The toys are all over the floor and there are a million papers stuffed into drawers and heaped into piles. I don’t have a cleaning service or even a babysitter (except my in-laws who pitch in once a week or so travelling from 75 minutes away). So when I post my testimony from today, I want you to remember that first and foremost that I am a mom. A mom who has a million responsibilities and a never-ending to do list that goes on for days. I am also a human being with fears and insecurities. I may have spoken today with confidence and passion, yet I have been too intimidated to hand out business cards at my sons’ school during pick-up or drop-off to promote this blog that has become so dear to me. I look at the numbers of people who are reading, and I am encouraged. I try not to get caught up in how few people share my posts or comment (whether publicly or privately). I force myself to smile and appreciate even the smallest of victories. And when I need motivation, I look at my children. I would much rather help sculpt a better world for them than agonize over the fact that I have lost my kitchen counter once again. Thank you to all of those who came out today to speak in Camden, and to all of those who were there in spirit. I am proud to be fighting alongside so many great minds and passionate activists. It is a shame that Commissioner Hespe left at the beak for lunch and did not give all of the speakers today the respect that they deserved. He should have at the very least offered his apologies.